All of us who reside in the City of Ryde live on land that was once the domain of a group of wandering Aborigines named the Wallumetta people. This group moved through their territory leaving very little evidence of their existence except for scattered carvings and middens and a concept of land “ownership” incomprehensible to the British when they arrived in 1788. This lack of understanding led the new settlers to believe that the land belonged to no one and was theirs to use. Thus the British concept of land ownership came to the colony in which individuals owned a designated area of land to provide for themselves and their family. The map below indicates who were the first non–aboriginal owners of land in the Ryde municipality. By pinpointing the various landmarks such as main streets, railway stations, etc in relation to your own home, you should be able to determine when the land on which it stands was first granted and to whom. Soon after arriving in the colony of New South Wales, Governor Phillip began granting land to soldiers and convicts in the hope that they would become successful farmers, supply their own needs and be less dependant on Government Stores. Among the first people to receive a grant of land in the colony were a group of Marines whose land was in an area called the Field of Mars. 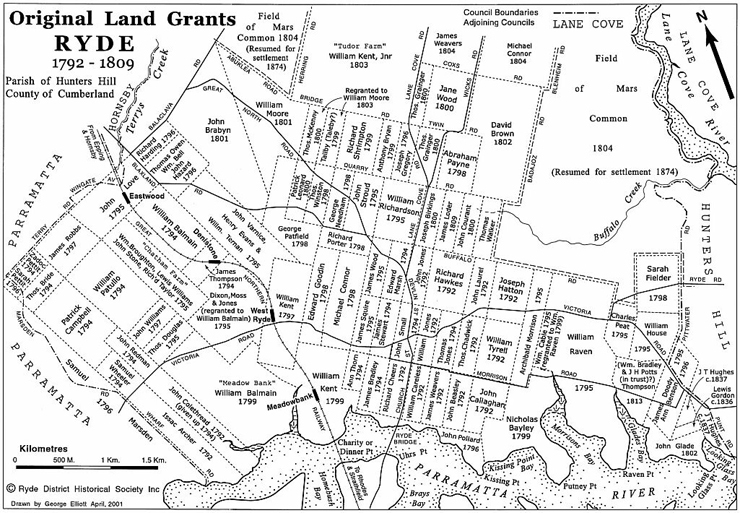 Two of these grants were to Isaac Archer and John Colethread whose land fell within today’s City of Ryde. These grants were dated 3 January 1792, some seven weeks before the grant of James Ruse, which has become known as the first land grant in Australia. Ruse’s claim to fame is not that his was the first land grant but that he was No.1 in the Land Grants registers. By 1809 the majority of land in today’s City of Ryde had been granted. A large swathe of land along the Lane Cove River remained vacant and was designated as a Common for the use of the local settlers to run their animals. The grants were made to marines, soldiers, emancipated convicts and some free settlers. The military men, some of their wives and the free settlers were given up to 120 acres in an attempt to keep them in the colony, while emancipated convicts were given 30 acres, a further 20 acres if they were married and 10 acres for every child in the family. Minor military were granted 25 acres. Who were the people who received these grants? It would appear that most of the land to the east of today’s railway line was granted to convicts and was known initially as Eastern Farms and later as Kissing Point while the land to the west was called the Field of Mars. Approximately half of the 90 grants were to convicts and the rest to military and free settlers. Five were women, one was the free wife of a convict, two were emancipated convicts and two were the wives of Marines. About fourteen of the grantees had arrived on the First Fleet and another 37 on the Second Fleet. The area marked “Field of Mars Common, 1804” remained empty of legal settlers until the 1880s when it was sold off to pay for the construction of the first Gladesville Bridge. This land was then settled by dozens of small farmers and investors and even by the 1950s much of it was still market gardens, orchards and poultry farms.